PHPRunner builds visually appealing web interface for any local or remote MySQL, MS Access, SQL Server, Postgre and Oracle databases. With PHPRunner right out of the box you get a complete web application with a set of web pages that all tie together. All of the pages are professionally designed yet highly customizable and offer a wide range of functionality. Make your website unique! PHPRunner provides you with multiple website layouts, color schemes and advanced WYSIWYG visual editor giving you all the necessary tools to customize the visual appearance of each page with the ease of drag-n-drop. You will be able to password protect the access to your web applications with very flexible yet robust security and permissioning that comes with PHPRunner right out of the box. You can choose the level of granularity and sophistication for your content protection.Regardless of your business needs with our software your information confidentially is well guarded. Once again I must take a moment to praise your work. Having skipped a few updates, I recently upgraded to PHPRunner 5.1. I find that it has evolved into a unique, stable and surprisingly comprehensive tool, a quantum leap beyond previous versions. Thank you for continuing to improve this exemplary product. PHPRunner supports MySQL, SQL Server, MS Access, Oracle, PostgreSQL, DB2, Informix, SQLite, as well as any ODBC-enabled database. If you don't have a database, the software will help you create one. PHPRunner lets you connect to your local database or a database located on a remote server. If you have a remote MySQL database, which does not allow direct connections, you will be able to connect to it using "PHP proxy" method. PHPRunner offers a large number of application templates - ready-made themed websites with complete graphical interface and database structure. All of the templates are easy to work with and completely customizable. The template could be used as a stand alone website, or could be integrated with other PHPRunner web applications. Some of the templates available with PHPRunner are: cars, classified ads, knowledge base, real estate, job listings, and news. WYSIWYG Visual Editor in PHPRunner allows you to customize the look and feel of your application with ease of drag-n-drop. PHPRunner will present you with the proposed layout for each page. However, all of the elements on the pages can easily be modified. The Visual Editor allows you to drag and drop, copy and paste the objects around the page. For all of the fields and labels on the page you can change the font, size, color, style, indentation, and alignment. The Visual Editor allows you to jump into generated HTML code and make your modifications there. PHPRunner let's you build sophisticated color-rich, highly customizable interactive charts and reports to complement your website. You will be able to choose from multiple chart and report types. You can also get a Web Charts and Reports Builder as part of the Enterprise Edition of PHPRunner, which will let you build the charts and reports online. After you have built your web application, PHPRunner provides you with multiple options how to preview it. The best option is to run your application using built-in Web server. You can also upload files to the remote Web server using FTP client. You can publish your application to our Demo Account Server or simply sign up for our Web hosting specifically dedicated to PHPRunner customers. PHPRunner automatically creates a SQL query that can be easily modified in the graphical pane or as text. The SQL Editor also allows you to preview the results of your SQL statement, create joins with drag and drop and specify the criteria (where, order by, group by etc). PHPRunner allows you to password-protect the access to your web application. You can either hardcode the username and password or store the login combinations in the database. PHPRunner also allows you to set the user groups permission where you can restrict the tables and views, pages, and site functionality either right in the software or online. PHPRunner lets you create a New User Registration page as well as secure your pages from SPAM abusers using CAPTCHA protection, which easily determines whether the user is a computer or a human. You can also restrict the users from entering weak passwords and allow them to request password reminders. With dynamic permissions PHPRunner will let you create and modify the permissions and assign users to certain groups right from the generated web application. Every time you will need to modify the permissions, create a new group or assign users to groups you will not have to rebuild your project. Dynamic Permissions are especially helpful in larger corporations where the application security administrators are not the actual users of PHPRunner software. With Style Editor in PHPRunner you can customize the visual appearance of your web application by selecting from a wide range of page layouts and color schemes and modifying them. You can instantly preview the results. PHPRunner supports more than 30 languages giving your users an ability to choose the language while logging in. You can also add the translations for table names and fields. The list of supported languages includes: Afrikaans, Arabic, Bosnian, Catalan, Chinese, Chinese (Hong Kong S.A.R. ), Chinese (Taiwan), Croatian, Danish, Dutch (Belgian), Dutch (Standard), English, French, German, Greek, Hebrew, Hungarian, Indonesian, Italian, Japanese, Malaysian, Norwegian (Bokmal), Polish, Portuguese (Brazil), Portuguese (Standard), Romanian, Slovak, Spanish, Swedish, Thai, Turkish, Urdu. With PHPRunner you can expand the functionality of your application by inserting events- fragments of PHP code. You will be able to define what an event should do and when it should be executed. A typical event would be to send an email with a new data, save data in another table, check record uniqueness, show related to current record info etc. You can either select one of predefined events or write your own from scratch. In PHPRunner all of your data sources and the relationships between them, including master-detail, are visually displayed making them very intuitive to understand and manage. You will be able to link two or more data sets with easy of drag-n-drop. Once you have the relationships established, in the application you can navigate through master records and quickly jump over to the details of those records. Some basic scenarios of master-detail relationships would be customer and orders data, patient and medical records or student-and courses information. PHPRunner supports three third party rich text editors to allow for a great control over content formatting including common structural treatments like lists; formatting treatments like bold and italic text, and drag-and-drop inclusion and sizing of images. The three options include the Basic Rich Text Editor, CKEditor, and InnovaStudio Editor that vary in features, versatility, and footprint. PHPRunner lets you upload the documents and images of any type to the database or to a directory on the web server. You can also create the image thumbnails on the fly, resize them on upload, and display them using iBox. With PHPRunner, you can use linked drop-down boxes, where values shown in the second drop-down box depend on the value you've chosen in the first one. You can link together as many drop-down boxes as you need in a linear chain or have multiple drop-down boxes link to the same master drop-down control. PHPRunner offers a large variety of edit controls, which allow you to customize the appearance of the fields on Edit and Add pages. The field formats that you can choose from include text field, date, time, check box, radio button, file/image, lookup wizard and others. PHPRunner lets you seamlessly integrate the web applications you build into your existing website. You will be able to closely match the look and feel of all of your pages. PHPRunner comes with built-in AJAX-based functionality making your websites much more user-friendly. You can search information more easily than ever with google-like auto-suggest feature. The AJAX driven dependent dropdown boxes also load much faster. With Ajax you will be able to preview the content by simply hovering over the links. PHPRunner will let you upload the entire set of pages to your web server via FTP. You will be able to set the upload properties based on your needs. PHPRunner will let you create and modify tables right in the software. You will have access to table properties where you can set the field names, types, sizes, as well as set the primary key field. 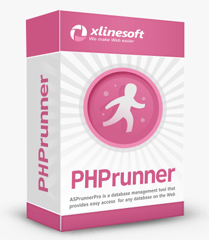 If you don't have a database at all, PHPRunner will let you create one too. To complement the list of our built-in application templates we offer three more templates that make up the Templates Pack that could significantly enhance your web application. The Templates Pack includes the Shopping Cart template, Calendar template and Members template. The Templates Pack is available for purchase to all existing PHPRunner users and is 100% guaranteed to integrate with your other PHPRunner projects.